2. I shaved half my head underneath in middle school and dyed it red. I was soooo cool. 3. If it’s not obvious by now, I am seriously into “grunge” music (product of growing up in the 90’s). I love Pearl Jam, Nirvana, Red Hot Chili Peppers, Soundgarden etc. Super excited to find this shirt at F21! 4. I once ate escargot and did NOT like it. 5. Survivor is my favorite show and I think it would be awesome to be an actual player, but extremely intimidating at the same time. nice shoes!! loved your dog, so cute!! Thank you! I love him too:) He is a rascal, but cute. 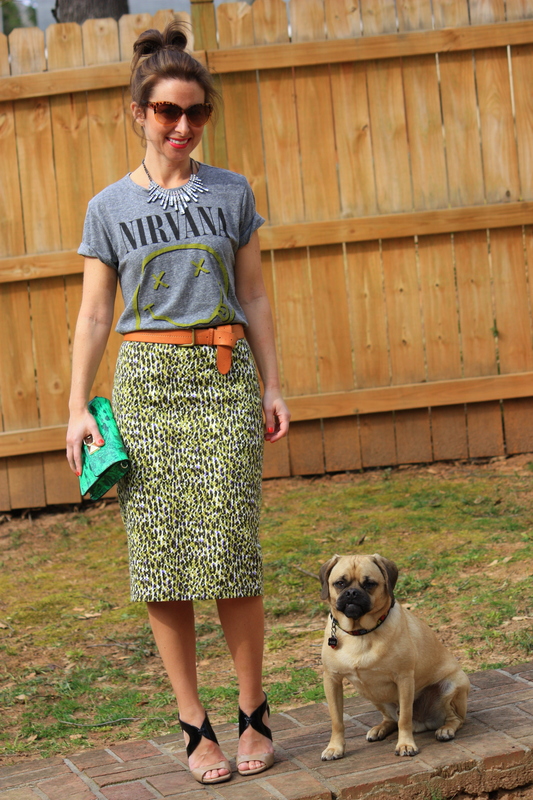 A tee and a pencil skirt?! Yes, Ma’am! Love it! cute outfit! I really like that skirt! Thank you so much! It is an oldie, but a goodie from J.Crew. Fantastic outfit! This is a great way to dress down a pencil skirt, I must try this. hehe RHCP and Radiohead are two of my favorite bands 🙂 Def would like some shirts with their reference on it! Just when I thought you couldn’t be an cooler, you had a car named “RHCP”! You are the best, bb! You look fab!!! I love this five things idea. Thanks for the tag bb! Glad you like the idea, Amy! Oh no. I’ve been tagged. What does this mean? I’m feeling a lot of pressure. No pressure;) You don’t even have to do one if you don’t want to. It’s just five things about yourself and then tagging five other bloggers you want to know more about. Your dog is so cute! Look at him posing next to you! What kind is he? Cute as hell…LOVE this outfit! And, you had me at Ken Follett. Thanks Britt! I saw he was your fave too;) Kindred spirits, we are. 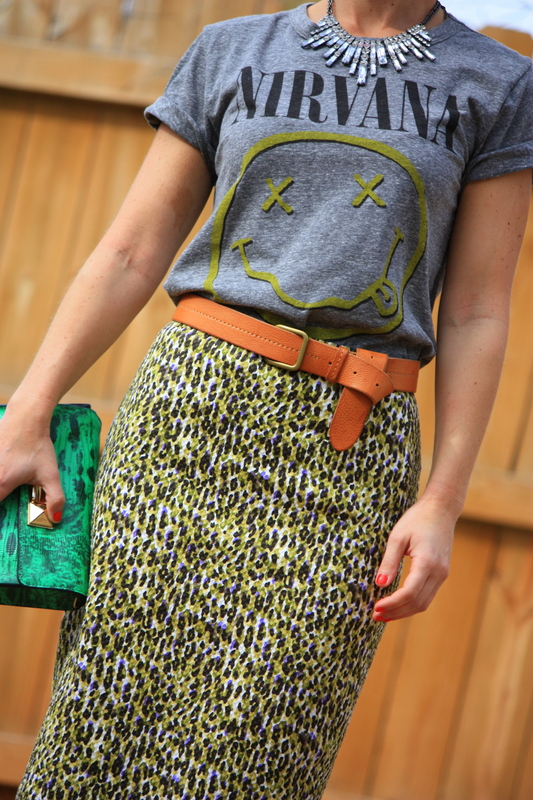 I love the tee with the pencil skirt. You have once again inspired a look for me! I have a Blondie tee that would be perfect for this. And your pup is so cute! Ha! So glad you are gonna do it TLG:) And thank you! Glad I could inspire a stylish lady, such as yourself, and my pup pup is cute, isn’t he??? Love this! Going to do it as soon as it warms back up here! Can’t even begin to tell you how much I love this outfit! You look amazing and your pup is adorable. Saw my tag, tomorrow’s post I’ll be sharing my 5 things. Have a fabulous weekend girl! XO! 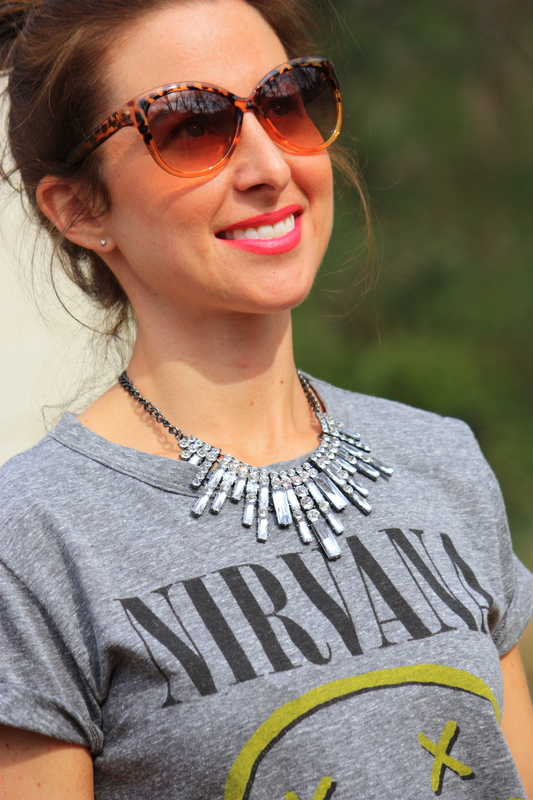 You had me at Nirvana….great look! !